I have several plastic lawn chairs that look kinda bare. I was trying to figure out a way to make cushions for them that would withstand rain and dirt. The ones in the store were too expensive and that was not an option. I racked my brain trying to come up with a solution. I decided to use flannel table cloths. 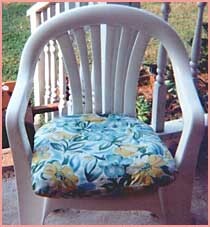 I took some old chair cushions I wasn't using anymore and used them to trace and cut out a pattern from newspaper - about 2 to 3 inches bigger than the cushion. Using the pattern, I cut the pieces from the flannel table cloths, and sewed them together, leaving the back part where the ties are usually at. I used peel and stick velcro for closures. 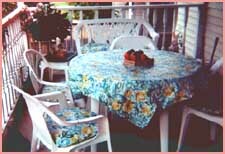 Then I bought a round vinyl table cloth for my round table to match the covers I just made for the chairs. It looks very custom made and expensive. You can make it for about 10 if you shop for bargain table cloths. They withstand the elements very nicely, and they can be cleaned with a damp cloth and look like new. Contributed by Annieleah Davidson, jandana@rnet.net.